You “develop your culinary intuition” at this school for newbies and pros inside the Santa Monica Place Shopping Center. Feeling stressed? They have a class for that called Pie Therapy that incorporates mindfulness, nixes judgement, and tackles control issues while you assemble and bake a pie (which you take home at the end of class). Couples nights (like the Argentine Steakhouse and Thai Street Food classes) fill up quickly so sign up when they first go up. 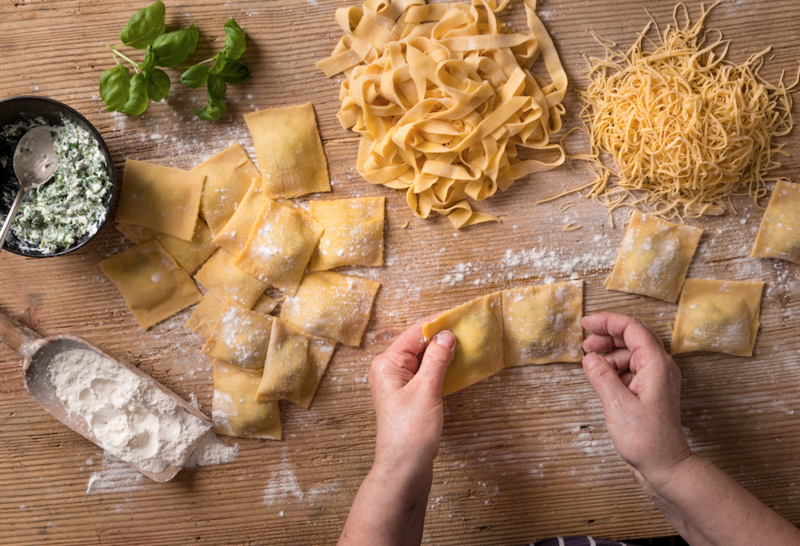 In Handmade Pasta and Hearty Sauce class you make fettuccine, whole wheat tagliatelle, homemade ricotta, and a fine puttanesca sauce. Classes run three-hours unless otherwise noted (Rustic Breads clocks in at six hours but you can BYOB). Sure this is where the professionals go (they have an extensive pro program and a cafe) but newbies should definitely try Basic Cooking at this charming red brick artisan cooking school. In the four-week course, you learn things like knife skills so you tuck your fingers, um, and don’t shave off your fingerprints, everything to do with chicken and fish, and how to prepare stocks and soups. Hint: Putting a lid on the pot makes the water boil faster. Yes. We had to be told this but they were terribly nice about it. At the end of class everyone eats the assignment. They also have specialty classes on how to make cool things like Dim Sum, bread, and macarons. You can forgive them for the name because the classes are so fun (and creatively named, hello, Ragin’ Cajun and Hipcooks Dream of Sushi) and really, what else do you call a cooking class in the Brewery Arts Complex? The former Pabst Blue Ribbon Brewery space is where you’ll actually find the Lincoln Heights classes (leave some extra time to find the loft in the huuuuuuge space). You imbibe while you learn, there is a lot of tasting throughout, and the Thai One On and Thai Two On classes are definitely worth a try. If you can stop shopping in the all-things-chef store (they actually call it a “District” – well – there is a lot going on in the warehouse-sized space) long enough to go to The Test Kitchen space in the back, you’ll get a lot out of it. There are freebie cooking demos on most Saturdays and if you are more serious sign up for a hands-on class. They aren’t fooling around—bring a tie for your hair if it’s long and only closed-toe shoes. You also have to be quick because popular classes like Persian Dinner or Taste of India fill up fast. Just keep an eye on the calendar when new classes pop up. We love Mia Wasilevich and Pascal Baudar’s classes where you stroll amongst actual nature and learn the difference between wild chard and poison oak and find scads of other edible natural goodies. At the end of class, more often than not, you create dishes based on your successful foraging and everyone has a picnic. There are foraging and fermentation workshops (wild kimchi!) and the Soup & Stroll series is weekly. The classes will also teach you which mushrooms are edible and which will land you on an episode of Dateline. You are offered a canapé the minute you walk into an Eatz class because every cooking class should begin with a bite-sized treat. Most classes teach you to prepare (and devour) multi-course meals and there is always alcohol involved. If you can get into the ever-popular Whiskey A Go Go class— where you infuse the stuff into everything from shrimp to sweet potatoes—do it. Eatz classes start and end with food—there will be leftovers. In Chef Yoko Isassi’s classes you start out with a field trip if you opt for her Seafood Market Tour & Cooking tutorial. The whole class heads to the DTLA wholesale fish market and gets the skinny from the dealers themselves (you meet at the market). Once you have the perfect specimens you take them back to the kitchen on Spring to make tasty stuff like Sashimi, Tamagoyaki, and Fisherman’s soup. If you are really serious try the Ramen Run Down course that they’ve been teaching here for over five years. And you can’t go wrong with Japanese Cooking 101. Kari Mozena is the Special Projects Manager at Los Angeles magazine and LAMag.com. You can follow her on Twitter and Instagram. She recently wrote: Disneyland Just Announced The Opening Date For The Guardians Of The Galaxy Ride And Its Surprisingly Soon. Previous articleThe Most Powerful Storm of the Season Is About to Hit L.A.